Not saying you have to believe that BU is going to be successful going forward, but this reason for them potentially failing does not really seem valid at this time. As defkit noted, Greeley remarked at the summer roundtable event about having four-year players in every recruit class. Quinn said the same thing at the 2013 roundtable explaining he’s well aware that two-year players (exceptional talents) and three-year ones (excellent players whose draft teams don’t want to risk a Kevin Hayes situation) have to be the cores of your program in order to consistently compete for titles. 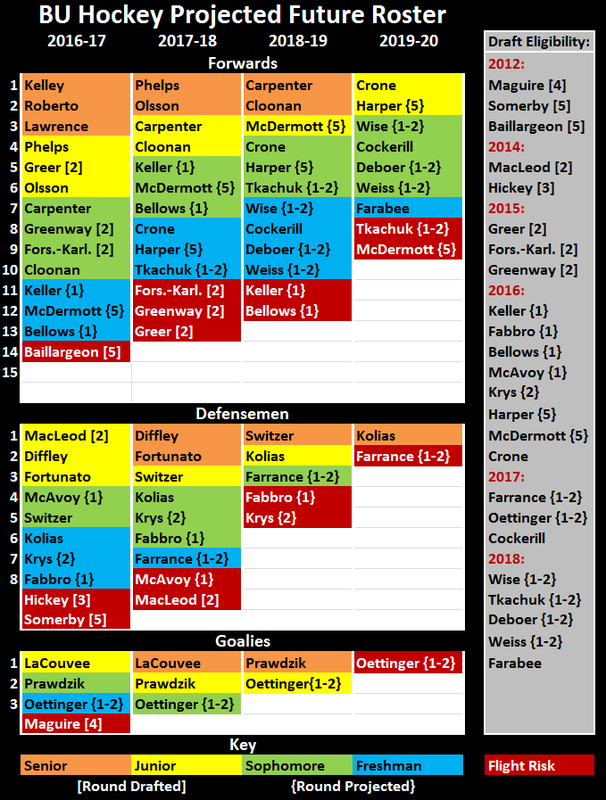 Some of those four-year players still will be among your top players for a variety of reasons, as is the case with O’Regan, Grzelcyk and Oksanen. The only place BU seems to have a logjam in the immediate future is at defense, where there will be nine Ds next season unless someone besides Somerby leaves early. The suggested issue of having too many skilled forwards is well..hokum. This season there are 15 forwards; would have been 16 if Letunov was accepted. At virtually every other top D1 program and all of Hockey East, at least three forwards sit every game. Right now, barring a defection, BU only has 14 forwards for next season. So rather than having too many, a 15th is almost certain to be added. Excellent piece in SB Nation about AC Albie O’Connell. After helping Quinn seal the deal on Fabbro, he made his way to Alberta Tuesday night to scout a game involving Hickey’s jr. A team, Spruce Grove. With all the talent at D we have, when Grzelcyk & Fortunato come back, there are going to be a couple pretty talented players riding the bench. Does anyone think Quinn would play any of these guys at forward a la Oksnanen (outside of emergencies) or is he happy keeping the 3rd/4th lines as they currently are? Interesting question. Grzelcyk has the skill, but I don't think you do that to your senior captain, who is an All-American. Fortunato showed some weakness in his own end on occasion last year, so in theory I suppose he could. My guess, barring injury, Switzer sits most, but gets an occasional game. And Fortunato and Diffley alternate as the other d-man sitting. Personally I would rather see Fortunato sit than Diffley - Diffley is better in his own end and still has shown some offensive ability. If anyone starts taking dumb penalties, Quinn can have a quick trigger to put them on the bench knowing he's got great talent that can step in. The reality is that someone is likely to have an injury as the season goes on. Disagree on Diffley/Fortunato. While his shot is very subpar, Fortunato is skilled at generating offensive pressure and getting a play going like point guard in basketball. That was something we sorely missed on Saturday night, the offensive generation looked disjointed and out of sync at times. While Hickey and McAvoy are highly-skilled offensive D, neither one is really an offense generator, they're scorers. Diffley, while skilled in his own zone, isn't exceptional, and certainly not better than MacLeod, Doyle, or Grzelcyk. If the choice is Diffley or Fortunato, I'd rather see the latter at this point. Rogie, it's not about having forwards who sit. Obviously teams are going to have reserve forwards etc. It's about who is doing the sitting and if that player can handle sitting/not playing. I'm not saying it's a problem having so much talent. Just don't expect one of these talented kids to just come in and ride the bench. They want to play, whether it is at BU or if they need to go elsewhere. A BC example would be Travis Jeke. Wasn't highly touted and even as a senior is not a staple in the lineup. When called upon he has shown the ability to step in and not kill you out there. Understands his role on the team and accepts it. Point being here is it sounds like the kids that will be sitting at BU will have quite the pedigree, certainly more touted than Jeke and guys like him. Maybe I have that part wrong though. Last edited by J.D. ; 10-15-2015 at 02:14 PM. I haven't seen McAvoy play enough - I figured he wouldbe similar to Grzelcyk and Fortunato in bringing the puck out (and Shattenkirk, Gilroy, etc.). Which is another reason I was leaning against Fortunato, because you don't need a bunch of guys that can do that, at least not at the expense of having the physical presence-type like Somerby and MacLeod. I see Hickey as being a hybrid, and Diffley the same with a lower overall skill level. But if you are telling me the McAvoy is more of an offensive threat in his zone, and not great at bringing up the puck, then I'll somewhat agree with your stance. I just can't get the image out of my head of Fortunato turning the puck over in OT (or was it late in regulation?) to Yale when he could have easily made a pass. Boy that would have led to a somber end to the season! You're right, Fortunato made some mistakes last season - but so did a lot of guys. From my impressions of him, McAvoy seems to fit more the mold of a Hickey than Fortunato, at least in that he hasn't really been one to initiate and organize the offensive pressure. Perhaps he can and we just haven't seen it yet. Of course, Grzelcyk is the #1 man for that role so to have him not out there Saturday left an enormous hole in that regard. But from what I've seen, Fortunato would be the next best option at least at creating opportunities for the forwards and other D to get quality scoring chances. You could make a good case that Oettinger deserved the first star. Kieffer Bellows, LW, 6-0/195, Edina, Minn. (Boston University) - He's not the fastest player, but he keeps up and he knows where to go to find the puck to get off shots. He also has a quick and strong stick that allows him to get shots off in traffic. His release is incredibly quick and he has a heavy shot. He scored twice by driving the net and letting line mate and fellow BU recruit Clayton Keller find him. He took a slap shot in the third period that went high and wide, but it took off so fast from his stick, it was hard to believe. Clayton Keller, LC, 5-10/168, Swansea, Ill. (Boston University) - He's a smooth skater with incredible vision and soft hands that allow him to be such a terrific set up guy. On all three goals Keller assisted on, he smoothly carried the puck deep into the zone before dishing it out front or out to the point. He doesn't possess blazing speed, but he's quick and agile. He has an active stick and caused a couple of turnovers by playing pesky. His offensive creativity and special hands let him create time and space to distribute the puck. He made a couple of real nice touch, saucer passes. Chad Krys, RD, 5-11/184, Ridgefield, Conn. (Boston University) - His skating ability and mobility allow him to cover a ton of space in the defensive zone. A left shot, He has a good active stick and did a good job most of the time in his own zone Friday. He did a good job of getting in shooting and passing lanes. There were a couple of spots where he got beat or was caught in no-man's land, but that's to be expected for a 17 year-old kid out against a premier college program. He has good footwork and is so nimble carrying the puck up ice. Jake Oettinger, 6-4/201, Lakeville, Minn. (Boston University) - He made 41 saves on 45 shots and did most of it look effortless. He's a big goaltender that covers a lot of net. He's a hybrid butterfly goalie who makes quick lateral movement in the crease. He's graceful and smooth in front of his cage. He challenges shooters and covers up rebounds quickly. A late '98, he's not eligible for the 2016 NHL Draft. BU recruits scored all five goals in the U18s 5-4 win against Dartmouth: two each for Bellows and Keller and a power play goal for Krys. Bellows has 11 goals in 11 games. Another excellent piece by ex-DFPer Conor Ryan. An added BU connection for Bellows: his father, Brian, scored 40 goals for the Canadian’s 1993 Stanley Cup championship team. One of his teammates on that Cup team was Ed Ronan, who played on BU's '91 Hockey East champs/NCAA finalist team along with Amonte, McEachern, Tkachuk and Mark Krys, Chad Krys's dad. Ah yes, brings back to mind the story of how when Pat Burns first saw Ronan on the bus, he thought he worked for the bus company (or something along those lines). And didn't Ronan get credit for a goal that Gretzky tipped into his own net during those 93 Cup finals? Scott McLaughlin interviewed Steve Greeley for his WEEI Puckcast focusing on BU recruiting. It begins around the 30-minute mark of the one-hour podcast. They discuss last year’s and this year’s recruits as well as recruiting philosophy and those coming next year. Greeley, who was at both BU games this past weekend, still uses lots of we’s. A few seasons after his Cup turn with Montreal, Ronan was a late season call-up for Buffalo and scored an OT goal to prevent a Flyers' sweep. When a reporter push a mike in his face, Ronan blurted out "I gotta call Coach Parker!" 2017 recruit Patrick Harper put up a double hat trick--six goals--plus two assists in a Mass Midget Selects U18 game that his NV River Rats won on Saturday, 12-0. In both of his previous two league games, Harper scored garden-variety, 3-goal hat tricks and leads the league with 17-10-27 in ten games. His passes do not miss, his vision is excellent, his speed is better – he is going to be a terror this prep season. BU gets its first commitment for 2019-20: left-shot center Joel Farabee of Selects Academy. Originally committed to UNH, he decommitted in September. Competition reportedly was BC and Providence. USHR had previously compared him to 2017 recruit Patrick Harper. 2015 - 2000 = 12?!?! !